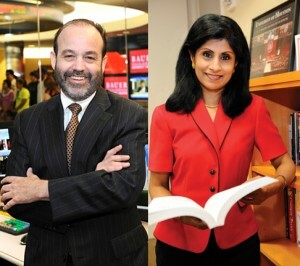 After a decade of service to UH Bauer as dean of the college, Arthur Warga announced his plan to return to the faculty, with Latha Ramchand, who has served as associate dean of programs and administration, taking the interim role. After a decade of service as dean of the University of Houston C. T. Bauer College of Business, Arthur Warga announced this week his plans to step down from the position and return to the faculty. Effective immediately, Warga will first take a leave and then return to the Department of Finance faculty as a chaired full professor. Latha Ramchand, who has served as the college’s associate dean of programs and administration, will serve as interim dean. Shortly before Warga assumed the role of dean in 2001, AIM Investments founder Charles T. “Ted” Bauer gave $40 million to name the university’s College of Business Administration, jumpstarting a decade of growth that included upgraded facilities, competitive faculty hiring, along with numerous national program rankings and achievements by student groups and teams. That growth will continue, as the university breaks ground on a third building for the college (University Classroom and Business Building) and continues to celebrate the recent grand opening and dedication of Michael J. Cemo Hall, home to the college’s Rockwell Career Center and additional classroom and meeting space. A noted academician and expert on international and corporate finance, Ramchand recently discussed trade between India and North America at the Third Annual Harris County International Trade & Transportation Conference. Prior to serving as associate dean of programs and administration, Ramchand was the college’s associate dean of graduate and professional programs. She is also a professor of finance and teaches in the areas of corporate and international finance and risk management. She received her Ph.D. in finance at Northwestern University, where she attended the Kellogg Graduate School of Management. She is a gold medalist in Economics from Bombay University, where she graduated with a master’s degree in economics. Her research interests include international and corporate finance. Her publications have appeared in leading finance journals, and she regularly presents her work at various national and international conferences, most recently the Third Annual Harris County International Trade & Transportation Conference hosted by Harris County Judge Ed Emmett. I graduated in 2007 in Finance and Professor Ramchand was not present at UH. 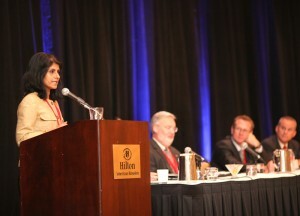 Dean Ramchand appears to be a quick study of success here @ UH. Congratulations to Dr. Ramchand; and thank you, Dean Warga. we will see each other more often than on the elevator. He has been very busy as Dean.